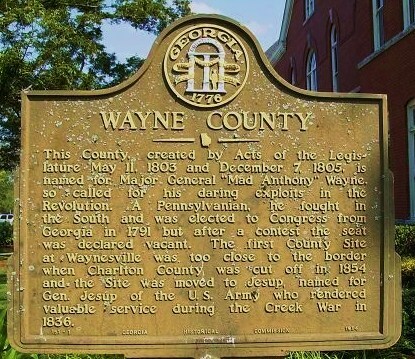 In the winter of 1824-25 a group of Revolutionary War “Baby Boomers” came west from Wayne County, Georgia to settle in what was then Irwin County, near the area that would one day become known as Ray City, Georgia. They were politically connected and probably had full knowledge that the huge area of Irwin county, occupying the central third of the southern Georgia, was about to be divided into smaller counties. Among the leaders of this small band of settlers were William Anderson Knight and wife Sarah Cone Knight, his brother Samuel Knight, and his son-in-law Isben Giddens. They brought with them their families, children, livestock, and their possessions to make a new home in the new county of Lowndes, which was created from parts of Irwin County in 1826. These pioneers were experienced at opening up a new county. They were frontiersmen with militia experience, and also experienced at carving farms and plantations from the wilderness of the Wiregrass. In a sense, they were the first ‘Americans’, born between the time of the Declaration of Independence and the ratification of the Constitution of the United States. They were raised in a time of war; their fathers served as Revolutionary Soldiers. Like the baby boomers of later wars, they grew up in a sort of post-war boom period, where Americans were celebrating their new-found independence and freedom. The Knights were true Wiregrass pioneers. They came to this section from Wayne County, where William A. Knight had been among the very first settlers, arriving there about 1803. The Knight’s Wayne County place was situated near the Old Post Road, one of the earliest roads in Georgia. On the land adjacent to Knight’s, another Wiregrass pioneer, William Clements, had settled his family. The Knights and the Clements became steadfast friends with many family and business dealings; William Knight and William Clements served together on the Wayne county Grand Jury of 1813 and worked together in other civic capacities. 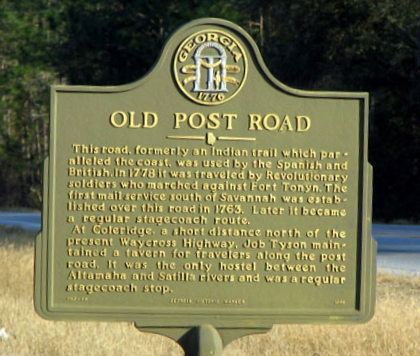 The Old Post Road…was originally an Indian trail extending from St. Augustine, Florida, northward through south Georgia into the rolling country known as the Sand Hill section. Mitchell’s map of 1756, now in the Library of Congress in Washington, shows this trail. During the Revolutionary War the American forces marched along it on their way to attack a British contingent at Fort Tonyn, which was somewhere south of [U.S. Hwy 84]. Historians have not been able to determine the exact site. The road continued to be used as a stagecoach route and post road between Savannah and Florida until the War between the States. When Wayne County had been created in 1803, William A. Knight was one of five commissioners empowered by the Georgia Legislature to determine the site of the county seat in the new county, and “when it was done it was located on lands owned by Mr. Knight and by William Clements.” The Wayne county seat became known as Tuckersville, after resident John Tucker who served as the first postmaster there. (Waynesville was not officially designated as the county seat until 1829.) William A. Knight served as a post master after John Tucker, and William Clements served as a Wayne County road commissioner. Tuckersville was located somewhere north of Waynesville on the Post Road near the Buffalo Swamp, once the home and feeding grounds of herds of Georgia buffalo. The town disappeared from maps after 1850 and its exact location remains a mystery. In its first twenty years, Wayne County was slow in developing. William A. Knight served as the tax collector for 1806 and 1807, but no monies were returned to the state Comptroller General’s office for those years. According to the New Georgia Encyclopedia “The area contained hundreds of acres of pine barrens and wiregrass country. Much of the land was undesirable for settlement… Many of the early white settlers were families who, having lost their bids to win richer land in Baldwin or Wilkinson counties in the 1805 land lottery, settled for the isolation and less desirable land offered by Wayne County.” Perhaps the lack of economic development in Wayne County finally discouraged the Knights. For whatever reason, it appears they decided there were better opportunities in opening up a new county than remaining behind in Wayne County. As a member of the state Legislature, William A. Knight undoubtedly knew of the impending division of the vast Irwin County into smaller counties. The military road constructed by John Coffee and Thomas Swain in 1823 had opened up the south central Georgia territory to pioneer settlers (see Daniel McCranie). 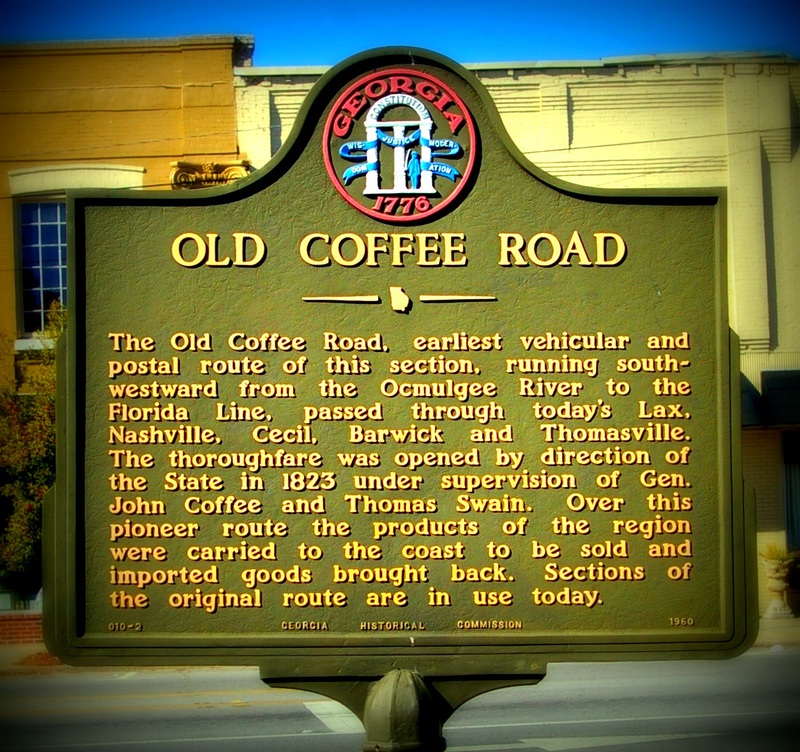 Coffee’s road, as it was soon known, passed from Jacksonville, GA through the site of present day Nashville, GA and on southward to the Florida line. When the Knights left their farms and came to south central Georgia to build their “log cabin in the wilds of the Wiregrass”, this area of Georgia was all part of the huge Irwin county. Lowndes was created from 2080 square miles carved out of Irwin, which had been plotted into Land Districts. Located on the center of Georgia’s southern border with Florida, Lowndes was still a quite large county. It would later be further divided into six present day counties; Lowndes, Brooks, Cook, Tift, Clinch, Lanier, and Berrien counties. William Anderson Knight chose a home site on the northwest edge of Grand Bay in what was soon to be Lowndes County. This area, in the 10th land district of Irwin County, had good water and better soil than the typical pine barrens of Wayne County. It was situated between the Alapaha River to the east and the Withlacoochee and its tributaries to the west. William Cone “Big Billie” Knight, born October 8, 1805, married Rachel Carter, daughter of Jessie Carter. William A. Knight’s place was near the route, such as it was, from Waynesville to Thomasville, GA. About nine miles to the west was Coffee’s Road; equidistant to the east was the site of Union Church, the Primitive Baptist church organized in 1825 by Reverend Fleming Bates and Reverend Matthew Albritton with the Knights, Pattens, Lees and Sirmans as founding members. 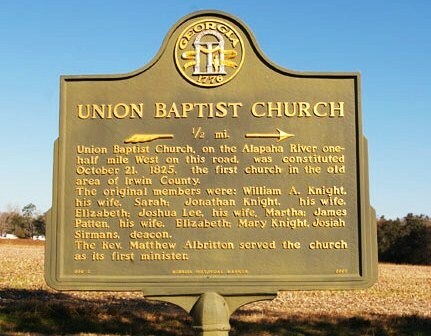 Knight and Union Church played a significant role in the rapid growth of Primitive Baptist churches throughout the Wiregrass region. Union Church was at the head of the local organization of these churches into a Primitive Baptist Association, then known as the Ochlocknee Association. In 1833, Knight was appointed to travel these new churches to instruct them on their duties and responsibilities to the Association. On July 13, 1833, William A. Knight along with Fleming Bates and John Tucker formed the presbytery to constitute Providence Church in “East Florida, Columbia County on Olustee,” according to the original minutes of that church. By 1835,& when Union Church and other churches of south Georgia and north Florida sought to divide from the Ochlocknee Primitive Baptist Association, Knight served on the presbytery in the organization of the new Suwannee Primitive Baptist Association. The Knight’s were influential in the development of Lowndes county from the very beginning, from the convening of the first superior court to the representation in state politics. William A. Knight became the first state senator elected from Lowndes county to serve in the Georgia Assembly, and his son Jonathan Knight became the first state representative. Following his parents , Levi J. Knight brought his new bride, Ann Clements Herrin Knight, to homestead in Lowndes County in 1827. Anne was the daughter of the Knights’ Wayne County neighbors, William and Elizabeth Clements. L. J. Knight chose a spot not far from Grand Bay, on Beaverdam Creek, where he established his home site. Perhaps even then he saw that the headwaters of Beaverdam Creek could some day be impounded to provide water power for a settlement. Levi J. Knight’s homestead became the nucleus of a community, first known simply as Knight, GA that later grew into present day Ray City, GA.